“President Obama, in a meeting”: Ali Frick, “Obama tells GOP: Don’t listen to Rush Limbaugh,” ThinkProgress.org, January 23, 2009. “Representative John Boehner”: Hugh Hewitt, “House Republican Leader John Boehner on the non-stimulus bill and Rush,” HughHewitt.com, January 26, 2009. “Limbaugh responded”: Matt Corley, “Are Republicans Starting To Hit Back At Limbaugh For Throwing ‘Bricks’ From ‘The Extreme Right’?,” ThinkProgress.org, January 28, 2009. “Representative Phil Gingrey”: Jonathan Martin, “Gingrey apologizes over Limbaugh,” Politico.com, January 28, 2009. See also David Neiwert, “Rush Rooolz! GOP Congressmen Cower Before the Mighty Limbaugh,” CrooksandLiars.com, January 28, 2009. “A similar fate”: David Neiwert, “I smell a right-wing feud in the offing: Limbaugh vs. Steele,” CrooksandLiars.com, March 2, 2009. “The next day”: John Amato, “Rush Limbaugh attacks Michael Steele and then Steele apologizes to RushBo,” CrooksandLiars.com, March 2, 2009. “Steele, too”: Mike Allen, “Steele to Rush: I’m sorry,” Politico.com, March 2, 2009. “Meanwhile, there were”: John Amato, “GOP tells Michael Steele: Shut up about Limbaugh or you’re fired,” CrooksandLiars.com, March 3, 2009. “Senator John Cornyn”: Ben Smith, “Cornyn petition: Limbaugh attack is an ‘outrage’,” Politico.com, March 5, 2009. “But by early October”: Alex Isenstadt, “Tea partiers turn on GOP leadership,” Politico.com, October 11, 2009. “Incumbent Republicans, too”: John Amato, “Lindsey Graham gets teabagged by climate change deniers at Town Hall: ‘You’re a Traitor’,” CrooksandLiars.com, October 15, 2009. “Local Republicans”: David Weigel, “The Lindsay Graham Censure,” Washington Independent, November 12, 2009. ” ‘I believe in the Constitution’ “: Shaila Dewan, “South Carolina Rift Highlights a G.O.P. Debate,” New York Times, November 29, 2009. “The battleground chosen”: “2009 New York CD-23 Special Election: Dede Scozzafava (R) vs Bill Owens (D) vs Doug Hoffman (C),” Pollster.com, chart of aggregated poll results. “Then Hoffmann picked up”: Eric Kleefeld, “DeMint Endorses Conservative Party’s Hoffman In NY-23,” TalkingPointsMemo.com, October 27, 2009. “and Republican representatives”: Eric Kleefeld, “GOP Reps. Cole And Rohrabacher Back Conservative Party’s Hoffman In NY-23,” TalkingPointsMemo.com, October 27, 2009. “On the 21st”: Glenn Beck Program, “Glenn interviews candidate Doug Hoffman,” October 21, 2009. “Beck is my mentor”: The Week, “Video: Doug Hoffman: Glenn Beck is my ‘mentor’,” November 3, 2009. “Meawhile, on the 22nd”: “Palin: Ready to shake things up in New York,” Reuters, October 22, 2008. “This set off”: Andy Barr, “Top Republicans jump ship in NY-23,” Politico.com, October 24, 2009. “Scozzafava did draw”: Tony Romm, “Gingrich endorses Scozzafava in NY-23 race,” The Hill, October 16, 2009. “On Saturday, October 31″: Mike McAndrew, “Republican Dede Scozzafava urges friends to vote for Democrat Bill Owens after exiting NY-23 House race,” The Post-Standard (Syracuse, NY), November 1, 2009. “The initial response”: Erick Erickson, “In NY-23, Conservatives Win,” RedState.com, November 4, 2009. “Glenn Beck’s denial”: Amanda Terkel, “Hoffman ‘Un-Concedes’ The NY-23 Election After Prodding From His ‘Mentor’ Glenn Beck,” ThinkProgress.org, November 16, 2009. “A week later”: David Weigel, “NY-23: Hoffman Concedes, Again,” Washington Independent, November 24, 2009. “The disappointed conservatives”: Michelle Malkin, “Newt for 2012? No, thanks,” MichelleMalkin.com, October 26, 2009. “At RedState.com”: Alex Koppelman, “Conservatives revolt over congressional candidate,” Salon.com, October 16, 2009. 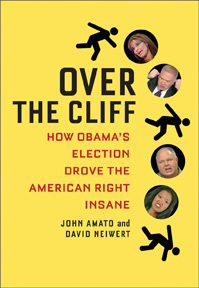 “But more important”: John Amato, “Rush Limbaugh blames Newt Gingrich for Hoffman’s loss in NY-23,” CrooksandLiars.com, November 5, 2009. “So Gingrich”: John Amato, “Newt Gingrich the latest Conservative to bow down to Rush Limbaugh,” CrooksandLiars.com, November 5, 2009. “Three weeks after the election”: Logan Murphy, “Palin Disaster in NY-23 Prompts GOP To Call For Party Purity,” CrooksandLiars.com, November 24, 2009. “Titled ‘Resolution”: Chuck Todd, Mark Murray, Domenico Montanaro, “A GOP Purity Test?” First Read (MSNBC.com), November 23, 2009. “When President Obama”: Nicole Belle, “Staying Classy the GOP Way: Cong. Joe Wilson Yells Out ‘You Lie!’ During Obama’s Speech,” CrooksandLiars.com, September 9, 2009. “It was unheard of”: David Neiwert, “Obama heckler Joe Wilson a member of neo-Confederate SCV, fought to keep Dixie flag flying in South Carolina,” CrooksandLiars.com, September 10, 2009. “In short order”: Carl Hulse, “In Lawmaker’s Outburst, a Rare Breach of Protocol,” New York Times, September 9, 2009. “Among the Tea Party crowd”: Erick Erickson, “Joe Wilson: Great American Hero! Bob Bennett: Unrepentant Fool,” RedState.com, September 9, 2009. ” ‘There are a lot of folks”: Andy Barr, “Joe Wilson: Right-wing folk hero,” Politico.com, September 16, 2009. “Former president Jimmy Carter”: Mark Murray, “Carter: Race Plays Role in Obama Dislike,” First Read (MSNBC.com), September 15, 2009. “Michael Steele at”: Ben Smith, “Steele denounces ‘race card’,” Politico.com, September 16, 2009. “Meanwhile, on all the cable shows”: Media Matters, “Reaction to Carter, Pelosi comments show media reluctant to discuss racism, extremism in Obama attacks,” MediaMatters.org, September 18, 2009. “So had longtime Fox anchor”: David Neiwert, “Brit Hume says that crying racism is bad. What about when Glenn Beck does it?,” CrooksandLiars.com, September 19, 2009. “Another former president”: Katie Escherich, “Bill Clinton: Race ‘Not Driving Opposition to President Obama on Health Care’,” Good Morning America, September 22, 2009. “Karl Rove appeared”: David Neiwert, “Karl Rove adamantly denies health-care debate is connected to race. But the numbers suggest otherwise,” CrooksandLiars.com, September 23, 2009. “As it happened”: Marc J. Hetherington and Jonathan D. Weiler, “Health Care, Race and Political Polarization,” Washington Post, September 21, 2009. “After Glenn Beck appeared”: David Von Drehle, “Mad Man: Is Glenn Beck Bad for America?,” Time, September 17, 2009. See also David Neiwert, “Dear Time Magazine: About that subscription renewal …,” CrooksandLiars.com, September 18, 2009. “former Bush speechwriter”: Peter Wehner, “Glenn Beck: Harmful to the Conservative Movement,” Commentary, September 21, 2009. “Joe Scarborough”: David Neiwert, “Joe Scarborough agrees: Glenn Beck is bad news for the conservative movement,” CrooksandLiars.com, September 22, 2009. “New York Times columnist”: David Neiwert, “David Brooks: The problem for Republicans is that race-baiters like Limbaugh and Beck own them,” CrooksandLiars.com, September 21, 2009. “Peter Wallsten”: Peter Wallsten, “Some fear GOP is being carried to the extreme,” Los Angeles Times, September 14, 2009. “WND had been especially keen”: See, e.g., Joseph Farah, “Y2K, FEMA and ‘domestic terror’,” WorldNetDaily, December 13, 1999; David M. Bresnahan, “Government plans for the worst in Y2K,” WorldNetDaily, March 4, 1999; David M. Bresnahan, “Clinton set to declare national emergency,” WorldNetDaily, November 29, 1999; and David M. Bresnahan, “Is the government hiding something?,” WorldNetDaily, March 4, 1999. “In 2009″: See, e.g., WorldNetDaily, “Is this really smoking gun of Obama’s Kenyan birth?,” WorldNetDaily, August 2, 2009; WorldNetDaily, “Obama’s ‘birth certificate’ not acceptable in Hawaii?,” WorldNetDaily, June 7, 2009; and Bob Unruh, “New bid to unseal Obama’s birth certificate,” WorldNetDaily, May 28, 2009. “A story by”: David Weigel, “Far-Right Site Gains Influence in Obama Era,” Washington Independent, September 4, 2009. “Some conservatives”: Jerome Corsi, “Bill creates detention camps in U.S. for ‘emergencies’,” WorldNetDaily, February 1, 2009 . “The spread of the falsehood”: Jon Henke, “Organizing Against WorldNetDaily,” TheNextRight, August 31, 2009. “As David Weigel explained”: David Weigel, “Joseph Farah Responds to WorldNetDaily Critics,” Washington Independent, September 2, 2009. “On the October 13 edition”: David Neiwert, “Sean Hannity helps Jerome Corsi promote his black-helicopter ‘New World Order’ conspiracy theories,” CrooksandLiars.com, October 14, 2009.